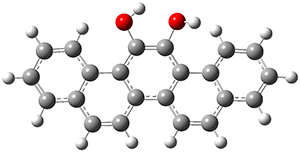 In searching for a redox switch, Matsuda, Ishikawa and co-workers1 landed on 13,14-picenedione 1, which could, at least in principle, be reduced by reacting with H2 to form the diol 2. The back reaction could then occur via the reaction with oxygen gas. They first optimized the geometries of both compounds at B3PW91/6-311+G(2d), and these geometries are shown in Figure 1. TD-DFT computations then predicted that 1 would be yellow (maximum absorption at 412nm) and 2 would be colorless (maximum absorption at 378nm). Furthermore, 1 should have no fluorescence while 2 should fluoresce at 464nm and be blue. Figure 1. B3PW91/6-311+G(2d) optimized geometries of 1 and 2. Of particular note is that the geometry of 1 is twisted, with the O-C-C-O dihedral angle being 34.9°, while there is essentially no such twisting in 2 (its O-C-C-O dihedral angle is 0.7°). The twisting in 1 manifests in antiaromatic character of the central ring, with NICS(0)=+13.2ppm, while the central ring of 2 is aromatic, with NICS(0)=-10.0. The redox properties therefore reflect the change in the aromatic character. They next synthesized 2 and reduced it with hydrogen gas to 1. The x-ray crystal structure of 1 shows a twisted structure (O-C-C-O dihedral of 28.87°). As predicted, 1 is yellow and 2 is colorless, and 1 has no fluorescence while 2 fluoresces blue. (1) Urakawa, K.; Sumimoto, M.; Arisawa, M.; Matsuda, M.; Ishikawa, H. "Redox Switching of Orthoquinone-Containing Aromatic Compounds with Hydrogen and Oxygen Gas," Angew. Chem. Int. Ed. 2016, 55, 7432-7436, DOI: 10.1002/anie.201601906.